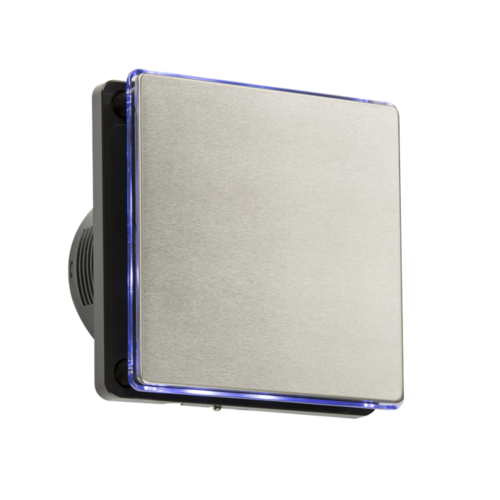 This stylish brushed steel low noise 100mm quiet bathroom exhaust timer fan is designed for use in toilets, kitchens, or anywhere with damp air or odours. This fan is suitable for use with up to 3 metres of ducting. This model includes ambient blue LED Backlighting behind the outer plate, resulting in a pleasant glow when in operation. The Knightsbride EX004T conforms to all relevant building standards, signifigantly reducing the risk of mould or damp in your home or workplace. The smooth, attractively styled plastic casing is easy to wipe clean, and is double insulated, requiring no earth. The EX004T features an integral overrun timer which can be set to 2-30 minutes of extra operation after room use, ideal for removing odours in kitchens or steam from smaller bathrooms. I am very pleased with the quality and service and good value, Thank you Philip Hyde. Does this have back draft covers. What else do you need with this fan? As it has no pull cord,how does it switch on, by light switch? What is the back draft cover?